HUBERT VOS (JOSEPHUS HUBERTUS VOS) | Geringer Art, Ltd.
JOSEPHUS HUBERTUS VOS (Dutch, 1855-1935). Hubert Vos was born in Maastricht, the Netherlands on February 17, 1855 to a family that produced several generations of artists. After the early death of his father, Hubert first established himself as a publisher and bookseller in both Brussels and Maastricht. Vos sold his business and then studied at the Académie des Beaux Arts in Brussels and with Fernand Cormon (1845-1924) a painter of historical and sensationalist scenes, in Paris. As his career advanced Vos exhibited his works in Paris, Amsterdam, Brussels Dresden and Munich. He and his first wife Aline Watteau — a relative of the famous French Rococo painter — had a daughter Isolde, born in 1887. Vos increasingly aligned himself with academic painting and after winning a gold medal in 1886, he was in Pont-Aven where he gained attention for criticizing the works of Paul Gauguin. He is described at this point as having “long carroty locks ” and wearing a green velvet hat in the style of Rembrandt. Vos served as a Dutch Commissioner to the 1893 Chicago world’s fair, and the experience enamoured him of the United States and also gave him an artisitic epihany. After noting the many portaits of Caucasian subjects he began to be interested in executing portraits of exotic (non-Caucasian) subjects. It was after the fair that he sold his London Studio and moved to the United States. In November of 1897 Vos was in New York when the Hawaiian Queen Liliuokalani made a visit, and he was smitten with one of her ladies-in-waiting, a divorcee — formerly Mrs. Graham — who was the Hawaiian Princess Kaikilani. He propsed three days after meeting her, and swept her off her feet. Their honeymoon was a world tour that included stays in Hawaii and Korea and which ended in Paris in 1900. Together they had a daughter, Marguerite. While traveling, Vos often executed his works in duplicate. 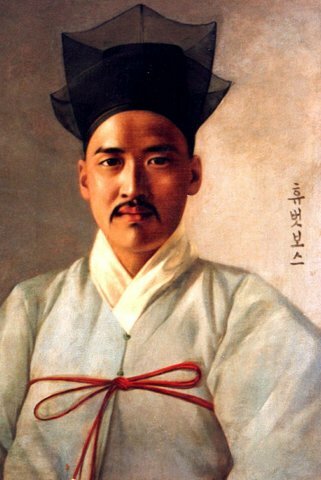 Copies of two works he left in Korea — a portrait of Min Sang-ho and a Seoul landscape — were hung in the Deoksugung Palace until they were destroyed by fire in 1904. During the early 1900’s Vos travelled in the Western United States painted images of American Indian subjects.Vos also served as a fine arts commissioner for the Netherlands at the 1904 World’s Fair in St. Louis. In 1905 Hubert Vos took his second and last trip around the world and became the first European painter to paint a portrait of China’s Empress Dowager Tzu Hsi (1835-1908). In Hawaii he had the reputation as a “court painter” and executed a portrait of the powerful Chinese/Hawaiian merchant Chun Afong. In retrospect, Hubert Vos is best known for the paintings he made in Hawaii, Indonesia, Korea, China, and Hong Kong. He is often grouped with Theodore Wores, Bessie Wheeler, Hubert and Matteo Sandona as one of the artists who made an effort to capture the life and culture of Old Hawaii before it disappeared. Strongly Eurocentic in his views, Vos had an interest in portraits of exotic racial and ethnic types and felt that a portrait should express “ancestry in race.” Among his racial portraits were composite portraits meant to feature common racial characteristics. In the late phases of his career, Vos also painted interior scenes and still-life images featuring Japanese porcelains. He moved in high society and attended at least one charity event dressed in Javanese costume. He died, of pneumonia, on January 8th 1935 in New York City. Works by Vos can be found in the collections of The Chicago History Museum, the Fogg Art Museum (Harvard University), the Honolulu Academy of Arts, the Metropolitan Museum of Art and the Smithsonian American Art Museum.